I’ve begun thinking about creating some print materials for Lifestream Blog including some stickers, business cards, and possibly a t-shirt (which I’m sure I’d be the only one buying) just to have something to hand out at any events I go to this year. Thinking about what to list on a business card without it getting cluttered or noisy can be challenging. So I went off on a tangent (as I often do) and thought about an idea for an intriguingly simple vanity card which I think would be so cool. It would be akin to say a minimalist theme to WordPress to give you some idea in geek speak. So I decided to create a mockup of my idea to see what it would look like. What do you think? If someone gave you this card how would you react? What would your first instinct be? 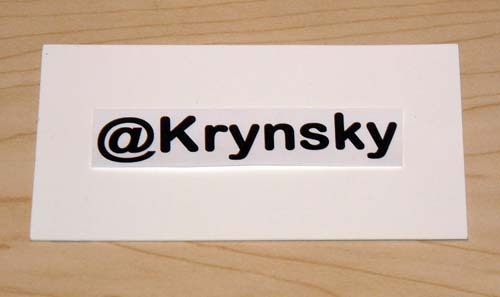 My thoughts are that I would visit the the username url at twitter.com/krynsky which would be cool because I could list full details there. But is that what you would do? The card could also act as a geek filter losing those who are clueless along the way. I haven’t decided yet if that’s good or bad :). Is this idea worthy or is it geek pretentious? What do you think? But ultimately physical business cards are outmoded. Most mobile phone can emit the same contact details over bluetooth. And to be honest, I rarely keep the business card people give me and just ask that they text message me while meeting face to face. $24.95!?!? Price gouge much? That's outrageous. No thank you. Thanks for the input. If you switch the shirt style to a basic white T, the price drops to $21. By default, @Twirts are printed on genuine American Apparel T-shirts, but there are many available options. I believe it generated quite a few hits. Visiting twitter isn’t really what came to mind for me. If the receiver is geeky enough, maybe. But perhaps you could clear that up by putting the exact twitter address on the flipside.